President Obama made huge promises to the American people about what he would do about immigration. He promised voters he would pass true reform legislation in his first year in office. Not only did he not pass any kind of reform, he did not even propose anything. And this was during a time where he controlled the U.S. House and Senate and could have passed anything he wanted. He did nothing. Now fast forward to the 2012 election. Suddenly Obama has his Homeland Security Program create an unconstitutional DREAM Act style of action where he deferred prosecution for two years of certain illegal immigrants and then created an illegal and unfunded guest worker program. Pure election year pandering by the President. Still no proposal or plan for immigration reform that is badly needed. Univision was the only national media outlet to call out President Obama on this issue. 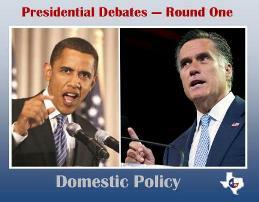 The Presidential Debates between Governor Romney and President Obama all but ignored the issue of immigration reform. I suggested it as a topic prior to the first debate. The Republican Party of Texas showed leadership in its adoption of "The Texas Solution" in its party platform, which included a legitimate proposal for a legal guest worker program. The Republican National Convention adopted similar language in its party platform when it called for the creation of a legal guest worker program. Legal because it would be created by and funded by Congress. Remember them? The guys who are supposed to create spending authorizations and a guest worker program requires spending. If President Obama is re-elected, Republicans in the House will have a very difficult time working with his "my way or the highway" attitude of legislative initiatives. However, if Governor Romney takes office in January, we will have a tremendous opportunity to develop a true reform of this process that will provide for securing our borders and developing a market driven reform of our broken system of immigration. This is much needed. Both for national security and for our labor force that will be required as Romney leads our nation back into economic strength and stability. 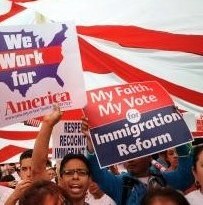 Is immigration reform coming? If Obama is re-elected, probably not. It is not only a possibility, but a probability under a President Romney. President Romney? Has a nice ring to it, doesn't it?